Every year I get numerous calls, e mails, and customers stopping by wanting to mount a plow "off a Jeep" on their Jeep. They think it should be that simple, it came off a Jeep, and they want to put it on a Jeep. I agree, but someone needs to tell that to Jeep, because they have this habit of making changes that cause plow manufacturers to have to redesign plow mounts to fit after Jeep makes changes. The good news is Jeep has resisted changes (historically anyway) for long periods of time. They have close to 10 year spans (and even longer spans years ago) where nothing has changed ,and mounts will fit those long spans of years. Another caveat, is that unfortunately, even though Jeep has a HUGE following, as the Jeeps age, they rot to pieces, and every year there are less of them out there. I do not mean overall, I mean in areas where people want to put snow plows on them. Of course you can likely find thousands of Jeep CJ’s out in the desert, and dry places like CA, AZ, NM, WY, TX, NV and others, the problem is those places have very few areas that would cause someone to ant to buy a snow plow for their 1972 Jeep CJ. I can say over the years we HAVE shipped plow parts to all of those States! They do get snow, all of them. The problem is plow manufacturers look a the upper mid-west and East Coast for the bulk of plow sales. So as the demand drops off, they stop making mounts for the older vehicles. They also look at sales (demand) for particular plow mounts, and of course they do not want to keep making a part that is not selling. They would have to keep the jigs they used to make it, interrupt current production to run a batch, and store the part itself, hoping to sell a given number, and it is just not worth it in the long run for them. This is where the word OBSOLETE comes in. Since plow mounts are one of the few pieces that they actually design and build themselves, they are all patented, and they do not share plans and measurements when they obsolete a part, so there is no aftermarket source. Unlike auto manufacturers that may sell their jigs, or dies to make body parts to the highest bidder. So when a plow mount becomes obsolete, that is it. So lets go over some (painful for some) facts about Meyer snow plow mounts for Jeeps over the years. We will start with the Jeep CJ. The most current (obsolete) Mounting Carton was the 17000. It was a Custom Classic mount that was later called the EZ Custom, because Meyer trademarked all of their mounts to have EZ in the name starting in 1993 with the EZ Mount, which became the EZ Classic. All parts of EZ Custom Mounting Cartons were vehicle specific, that means NONE of what is in the box fits ANY other vehicle. Read that last line again. NONE. 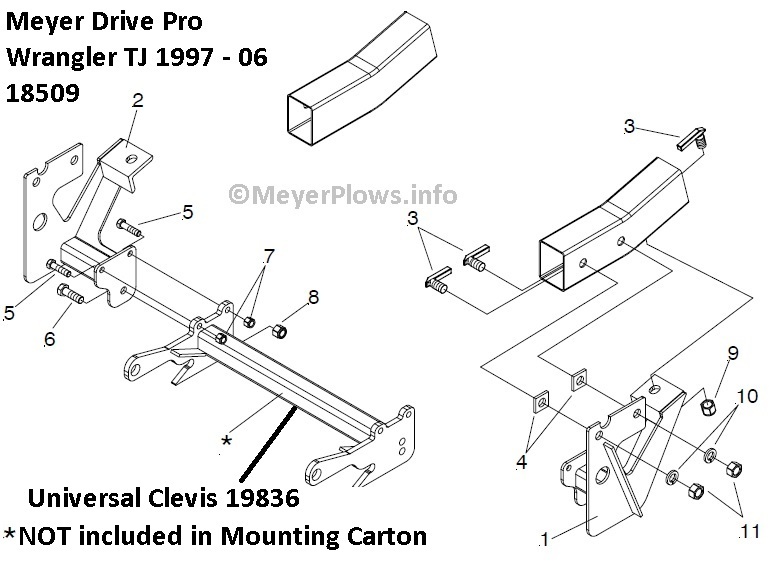 (The ONLY exception in this case is that for whatever reason Meyer included the plow Sector and A frame IN the Mounting Carton. The same Sector and A Frame fit the original Ford Bronco and the International Scout and Scout II). Now you can say “well what if I modify it”? well geez, with a torch, a welder, and a pile of scrap you can make anything fit anything, BUT that is not always the best idea. Just because you want it to be so, does not make it a good choice, or a smart one. Custom mounts are named appropriately, they are custom made for each vehicle. They will fit the span of years the vehicle frame (specifically the front end) stays the same. When the auto maker changes the frame or bumper, then the plow manufacturers have to redesign a new mount to fit taking those changes into consideration. Custom mount fit behind the vehicle bumper. Only the Lift Arm protruded past the bumper, and there was (is) a decal on it reminding the owner to remove the Lift Arm in the off season because it protrudes past the bumper, and in a collision can be deadly. 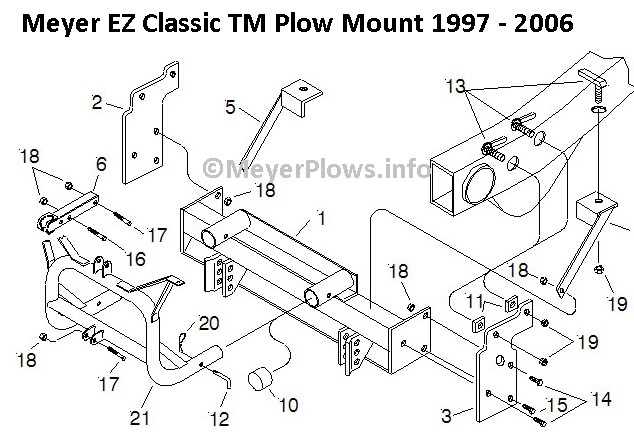 The Jeep CJ Mounting Carton 17000 is a prime example of how plow mounts have evolved over the years. Prior to the 1990’s it was VERY common for plow mountings to attach WAY back under the vehicle, like under the driver’s seat (much like farm tractors). The 17000 CJ mount goes UNDER the front axle and up to the Jeep frame. What was also common was the attachment points for the actual plow A Frame to attach to the vehicle mount via the pins. You had to crawl under to install the mounting pins. This mean the A Frames were quite long compared to today’s A Frames and the Jeep was no exception. 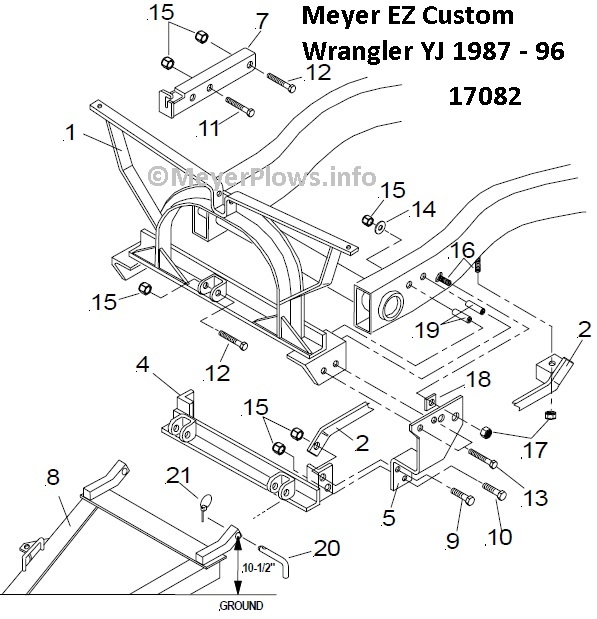 So here is the Meyer Jeep CJ EZ Custom Mounting Carton 17000 diagram. Next when Jeep killed the CJ line and replaced it with the YJ in 1987, Meyer had to design a Mounting Carton to fit. Because in 1987 the Custom was the only mount, that is what they designed. In the Mounting Carton once again was the Sector and A frame, however, in 1987 the Jeep was the only current vehicle that used this A Frame (the Sector was/is a standard ST Sector that fits all of the ST plows) and its ears where you put the pins through to attach it to the mount are spaced at 17.5” on center, it is the same A Frame as the Jeep CJ. ST A Frames for full size trucks have the ears spaced at 23.5” on center, but they shared the same ST Series Sector. So same A Frame, you still have to crawl under to put the pins in to attach the plow to the Jeep. Same style Lift Frame, you are supposed to remove the Lift Arm in the off season. It is mounted on top of the end of the vehicle frame, behind the bumper. Now the mount did not extend under the front axle, but it did have braces going back to the frame as you can see in the diagram below. Like the CJ, the YJ had front leaf spring suspension, so weight was not a big factor back then. The public was still of the mindset that the Jeep was a utility vehicle, and if the front end sagged, you just added a leaf to the spring pack, there was no consideration of FAWR (Front Axle Weight Rating) exceeding the FAWR was VERY common. It did not matter that you were also exceeding the braking capacity of the vehicle causing longer stopping distances, because back then, the Jeep would be screaming doing 55, AND most plowing is done in 4wd, so speed was not really a factor. The complete ST-7 plow set up weighed in at 669 pounds. The next redesign was in 1997, when the Jeep Wrangler TJ came out. All of a sudden the old trusty Jeep had a coil spring front suspension, and a lower FAWR. That mean that Meyer was going to have to design a mount for a lighter plow to be used. 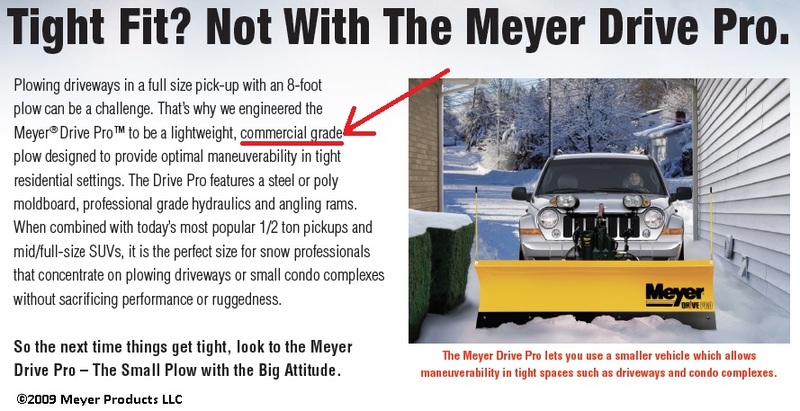 Meyer already had the TM plow that was used on the Chevy LUV in the late 70’s (1979 specifically the first full year of 4wd for them) and it was also already being used on the Jeep Cherokee, and other downsized vehicles. Also, on Feb 26, 1990 Meyer applied for the EZ Classic (Quik Lift) patent which was granted Aug 6, 1991. So the “current” style was the EZ Classic, and they already had a much lighter (than the ST Series) plow to use. It was natural for them to design what is often referred to as a TM mount for the new Jeep Wrangler TJ. The downsized EZ Classic TM plow mount allowed the Lift Frame to be removed in the off season, limiting liability in a front end collision because the Lift Arm was not removed, AND shed some weight that did not have to be on the front end of the Jeep year round. It also allowed there to be nothing permanently attached to the front of the vehicle that extended past the front bumper (note that I said “allowed”). 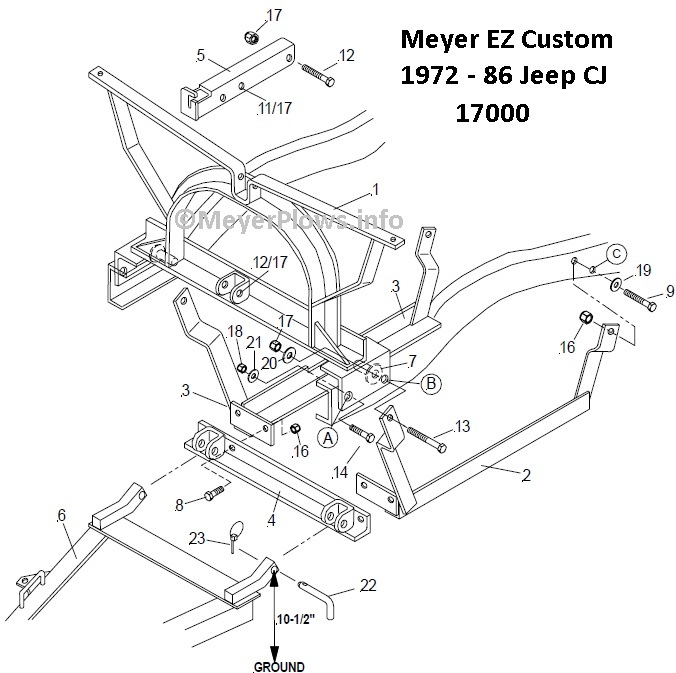 Another little tidbit is that because of the steering box location on the Jeep frame, Meyer had to design a Lift Frame to fit, because the one they already had for the Cherokee, S-10, Ranger, etc, would not fit. The one for the Wrangler TJ had to be narrower, so there is a TM Lift Frame that ONLY fits the Wrangler TJ. Just another pitfall for someone who knows no better and buys a used “TM” Lift Frame only to find out it does not fit, because they believed the seller when the seller told them it came off a “Jeep”. IF it doesn’t fit it is because it came off a Cherokee…. The complete TM-6.5’ plow set up weighed in at 473 pounds. So the TM was about 200pounds lighter than the old ST set up. Read that again when you think it is OK to make an old ST off an older Jeep fit your TJ. Not only that, BUT the EZ Classic mount put the location where you put the pins though almost flush with the front bumper, so now you also have the much heavier ST plow sticking out ever farther, putting even more of a load on your front axle, exceeding the FAWR even more. Good luck if you get in an accident and the lawyer is smart enough to go after you or whoever decided it was OK to install the plow on your Jeep. THAT is the main reason I will not “make” a plow fit anything it was not designed to fit, LIABILITY. By installing a plow that was designed for a given vehicle and purpose, ALL of the liability would fall on me, and none on the manufacturer. NO thanks. 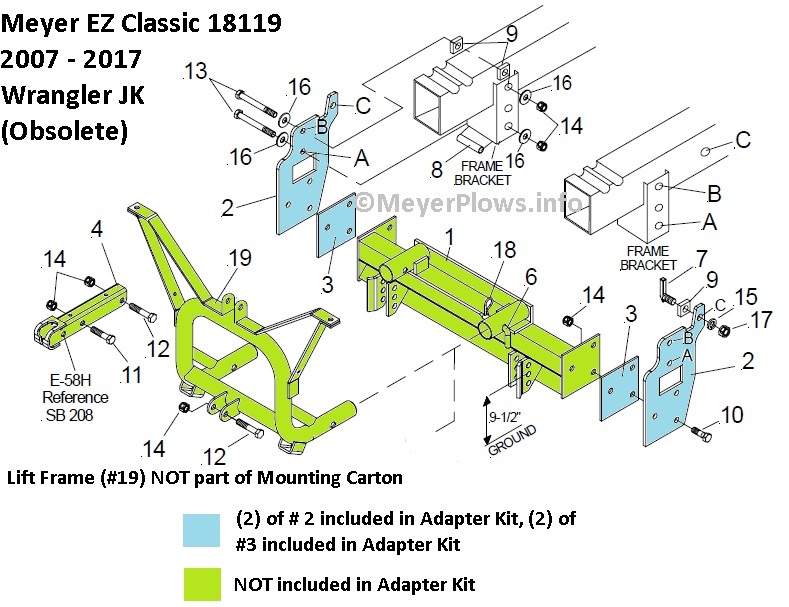 So here we have the 18080 Meyer EZ Classic Jeep Wrangler TJ Mounting Carton. Like previous years, in also includes the TM A Frame and Pivot Bar (which replaced the Sector). That is why the TM Mounting Cartons are were/are so expensive, they include the PAF(Pivot Bar and A Frame). In 2007 Meyer came out with the Drive Pro. It was once called “a commercial” plow, and described as a light commercial plow for tight places, but Meyer rescinded that, and later designated it as a “Personal Use” plow only. Designed for residential settings. The plow itself did not change one bit, it is the same as when it came out in 2007 except the cutting edge went from ¼” to 3/8”, and the Jack Leg was replaced by the Crankstand. When they unveiled it (I was there in Cleveland in June 2007) they said it was for residential and light commercial because it was great on commercial sites where larger plows could not fit, such as drive thru lanes, banks, fast food places, cul-de-sacs, etc. 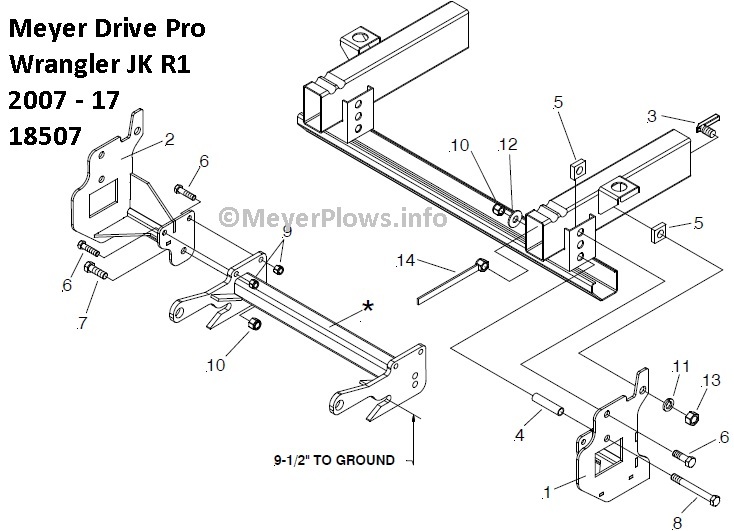 Since it was 2007, and it was the first year of the Jeep Wrangler JK, Meyer designed the Drive Pro Mounting carton for both the TJ and the new JK. Since the YJ was about 10 years out of production, and they already offered a plow for it, they never designed a Drive Pro mount for the Jeep Wrangler YJ. The Jeep Wrangler JK has the same frame width as the previous years TJ BUT they made a slight change. They added a crossmember and the brackets that attach it to the outsides of the frame up front right where the plow mount attaches makes it just a little wider (we will get back to this later). The reinforcement is on the inside and outside of the frame rails. The spacers go in these reinforcement channels to prevent them from crushing when the bolts for the plow mount are tightened. The change added strength to the frame ends, so for the first time, a Meyer plow mount does not have any type of braces extending back from the mount to the frame. The reinforcement has three holes on the outside of the frame (and inside), and the Meyer brackets use two of them as the attachment point, with a third right under the body mount on each side (which the hole must be drilled for). The drawing of the mount is not 100% accurate, in that the ends of the Jeep frame rails are not open as drawn. Jeep added an accessory on the inside of the frame rail around 2012 making it difficult to drill all the way through the frame for the top mounting bolt to go through, so they made a revision. Instead of going all the way through with a sleeve, a bolt goes through the outside of the frame only, and a handle nut is used on the inside of the frame. Now, as I said above we would get back to the frame width not changing except for the reinforcement adding a little on the outside of the frame rails. By using spacer plates, it is possible to use the Clevis from a Jeep Wrangler TJ Meyer EZ Classic mount on a Jeep Wrangler JK. Meyer released Mounting Carton 18119. Once again, it contained the PAF, which drove the price up. We found most who had a plow off a TJ had the mounting and the plow, and just needed what was missing to make it work, so we came up with our own kit using the Meyer parts. Our kit includes the parts highlighted in blue, and the Hardware Kit. Mounting Carton 18119 has been discontinued by Meyer. We have a limited number of our kits available and will keep selling them until Meyer no longer offers the parts we use to make them. Mounting Carton 18119 includes all the parts (in green too) except the Lift frame it is sold separately. Mounting Carton 18119 has a 2017-18 List Price of $1305.12. It is easy to see why it was not a big seller. 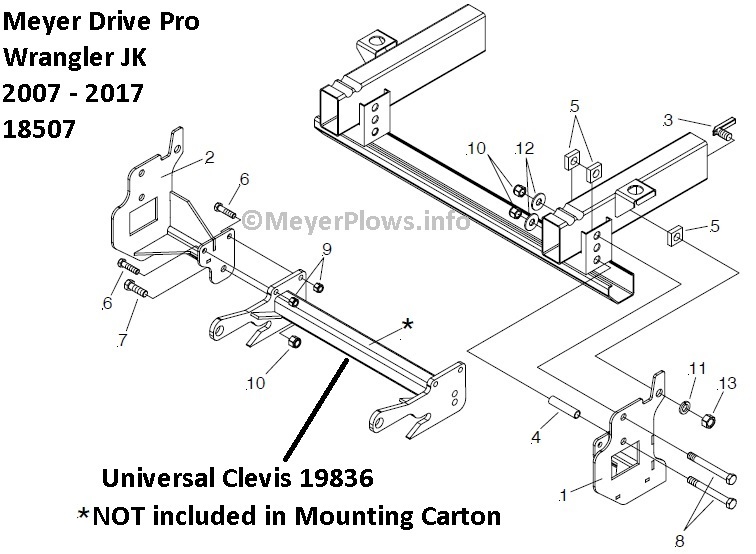 So now you can see the differences between all the various Meyer Plow Mounting Cartons for the Jeep from the 1972 CJ all the way up to the 2017 Wrangler JK. Hopefully we will be updating this page next year once the 2018 Jeep Wrangler JL is in full production, and we find out if the fact that it has electric assist power steering prevents us from installing plows on them. IF so, it will be the first time in 75+ years that a Jeep can't use a plow!